Tough on dirt and grime, yet completely PH neutral; gentle on delicate painted and metal surfaces, yet formulated to be used without the need for brushes; Sdoc100 Motorcyle Total Gel Cleaner removes road grime, dirt and grease without scrubbing or harsh chemicals, so there’s no risk of damage to paint and metalwork. Gloss Wax Spray gives a mirror finish and colour depth, with long lasting weather and environmental protection. Simply spray on after cleaning (or between major washes) and buff up with the soft microfibre cloth provided. Corrosion Protectant shields metal parts against the effects of road salt, as well as lubricating, displacing moisture, and stopping any existing corrosion in its tracks. It even turns rusty iron and steel back to black! Packed in a handy tub, the SDoc100 Classic Cleaning Kit sells for £37.99 (including VAT) and is available from Motohaus Powersports on 01256 704909 or via their website: www.motohaus.com. Useful gift idea for father’s day and its release is timed nicely for the commencement of the motorcycle season, especially as temperatures were topping 20 degrees this week. Simply apply the power gel to the target area, leave to soak in for a few minutes and then rinse, the unique gel-type formula means the lubricant doesn’t just fall to the ground but actually clings to your bike, agitate stubborn grime with a soft brush and your bike will be gleaming in no time. The gloss wax compliments the cleaner perfectly and leaves your bike with a perfect shine, after buffing with the microfibre cloth provided, leaving an invisible film – watch the rain water run off…Also very useful (and recommended) to use before laying your bike up for winter. The colour refresher helps to ‘refresh’ faded engine casings, rubber and black plastic. It isn’t the cheapest cleaning product on the market but it is probably one of the best, although we could only get 4-5 washes per bottle. 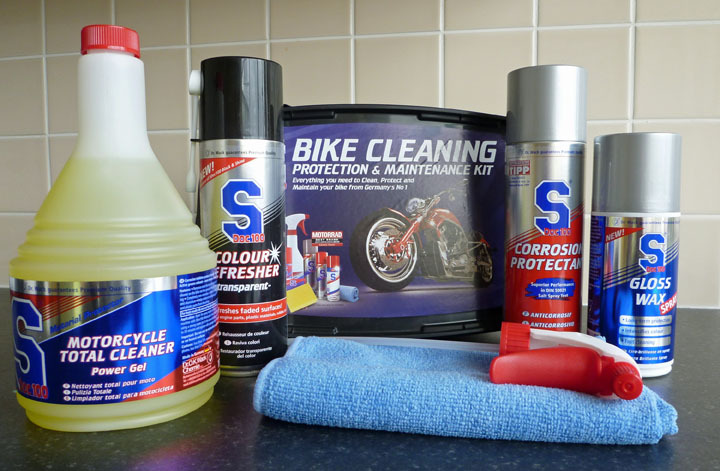 Go on, treat your bike this spring….we will! 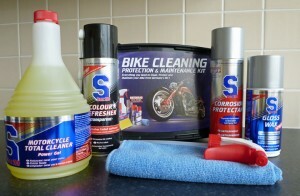 Sdoc100 also provide other useful products such as chain lube, cleaner, black and shine, polish and visor wipes. Top Gear Duo Classic Bikes Sold!